Since leaving Pinkerton’s to venture out on his own, Michael McGill’s career as a private investigator has been spiralling downward. He shares his office, located in a pre-revanchist district of Manhattan, with an indestructible rat. When he is visited covertly by the White House Chief of Staff and offered a whole heap of money to find a missing book, things start to look up - for a very brief moment. The book in question contains the real US constitution, written by the Founding Fathers to rescue society if it descended into grave crisis. In the view of the Chief of Staff such a situation has now been reached given the levels of debauchery and violence, lack of civility and general godlessness. The book disappeared decades previously and is rumoured to be swapping hands for favours, blackmail and very large sums of money. All McGill has to do is descend into the dark underbelly of America, follow the trail, and retrieve it. 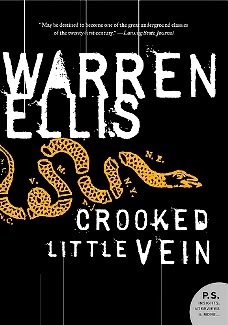 Warren Ellis freely admits that Crooked Little Vein is designed to offend its readers. He submitted the first ten thousand words to his agent in the hope that she’d take the hint and leave him alone. Instead she sold the book and asked for the rest of the manuscript. The result is an oddly compelling read that is at times both hilarious and repugnant. The hook is to send the self-destructive private investigator Michael McGill on a dark journey through America’s sexual and political underbelly. He’s accompanied on the journey by Trix, a researcher who’s writing a thesis on the extremes of self-inflicted human experience and is a self-confessed nymphomaniac. The prose is engaging, the pace high, and the plot just about credible enough to keep the reader hooked. The progression of the story, however, is a little too linear and straightforward (making one wonder why McGill was needed at all) and the tale starts to run out of steam as it nears the end. Overall, a fun and funny read, but not for those who are easily offended. I have another one of his books. Gun Machine. I hope I like it.